Leo Geo doing some research, from Jon’s blog. All images courtesy Jon Chad. Jon Chad is all my favorite kinds of nerd. Seriously. He loves comics. He loves science. 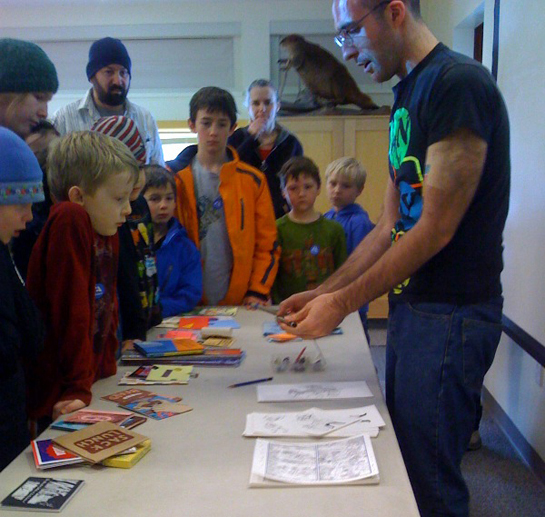 He loves the art of bookmaking (not to be confused with the mathematics of bookmaking). People, I have to come clean: I have a secret past life as an aspiring geophysicist. 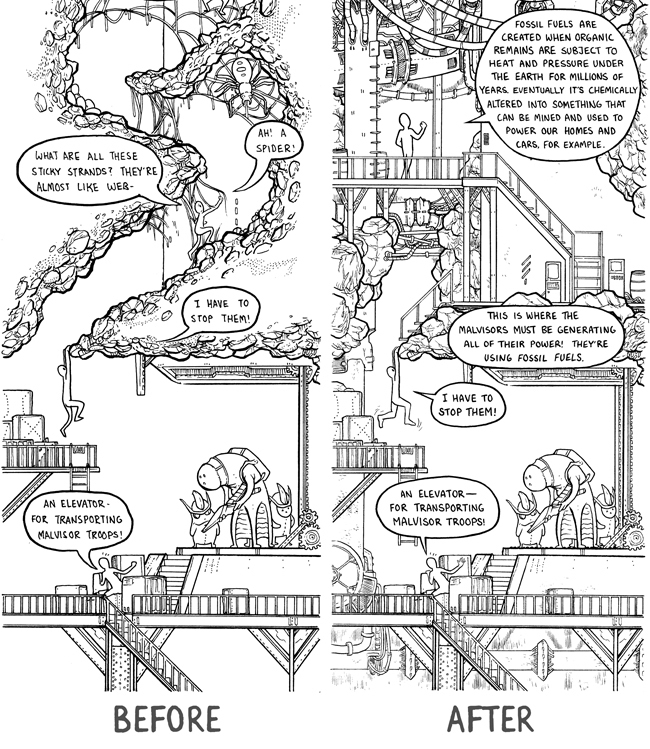 So you can imagine my delight when I discovered that OMG SOMEONE MADE A GEOLOGY COMIC, in the coolest format imaginable: you turn the book sideways to follow a vertical adventure. A page from Leo Geo (click to enlarge). Leo Geo and His Miraculous Journey Through the Center of the Earth is Jon’s long, skinny foray through the lithosphere, into the mantle, AND BEYOND. (Hint: core.) Today, Jon discusses the creation of Leo Geo. Workspace: I split time between my apartment and my studio in the Center for Cartoon Studies‘ Inky Solomon Center. Biggest influences: Julie Chen’s artist books; Japanese Tokusatsu (Godzilla, Inframan, etc); Closed Caption Comics‘ screen-printed work; David Macaulay; and Fort Thunder, a now defunct artist collective/performance space in Rhode Island. Caffeine of choice: Half mild brew half decaf coffee. The local barista tells me this is a half-caf mild. I’m really prone to caffeine, so I only use it in emergencies! …as an adult: Full Moon Soup by Alastair Graham. I must have looked through that book a billion times, and I’m not sure I’ve found all the little details going on. Interesting science fact you are most likely to mention at a cocktail party: Did you hear that there’s a planet that scientists discovered that is entirely made of diamond?! My favorite part about this is there isn’t any semantic sidestepping in any of the reports that I read; it’s a GIANT 26.9 NONILLION (30 zeroes) DOLLAR DIAMOND. Most prized studio tchotchke: This model of a pinball machine. Me and my friend Alec Longstreth write a pinball zine, Drop Target, and one of our readers sent this in. So cute. Favorite thing to read: I’ve been on an auto-bio kick lately; re-reading my Clutch collections. I’m also totally obsessed with books about bookmaking and artists books. I just got the Esther Smith book Magic Books and Paper Toys. It’s pretty awesome. YouTube video you can’t stop watching: Ha ha, I know this isn’t new but I’m really into this Kanye West video Power by Marco Brambilla. All of Brambilla’s stuff is really great. We love a good road-to-publication story. How did this book go from self-published comic to part of the Roaring Brook lineup? 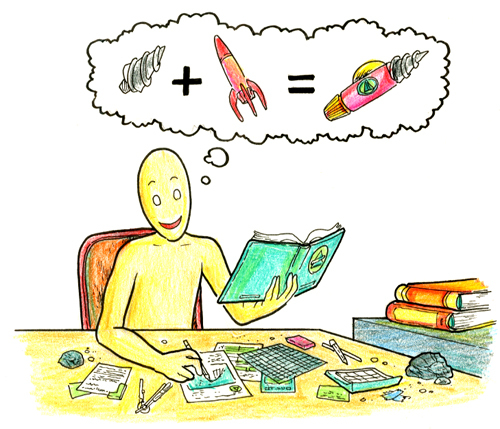 When I was attending the Savannah College of Art and Design, I entered a one-hour zine-making competition. On a whim, I decided to make a minicomic following a blobular little guy (named Leo!) as he traveled through a snake and spouted facts / encountered weird creatures. I wanted the art to be continuous, and tell a story that was clearly comics, but had no panels. 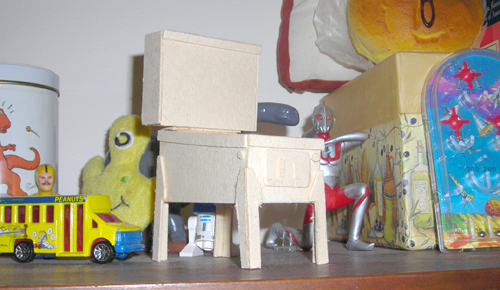 The story moved horizontally, but this was the prototype for Leo Geo. I was so pleased with the results that I toyed with the idea of making another one, but trying out a different concept. Doing a vertical comic seemed like it would be fun, and I was instantly enchanted with doing a book about geology. I drew the entire comic during the summer of ’07 while I was interning at the Center for Cartoon Studies (where I now teach). It was the most ambitious self-publishing endeavor I had undertaken. Screen-printing, die-cutting, and unusual book sizes were completely outside of my wheelhouse. 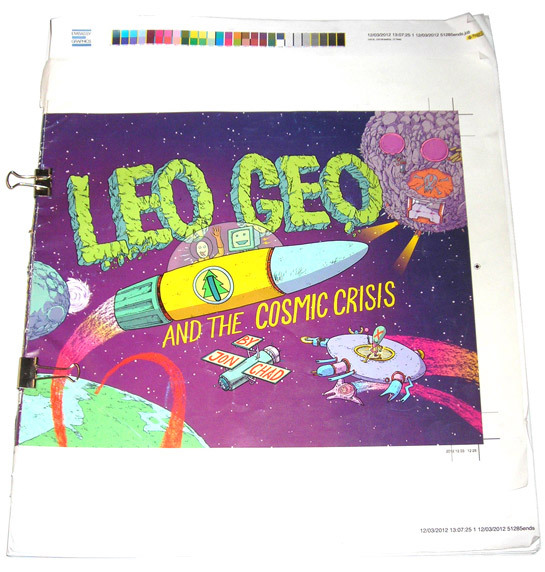 Between then, and when my Roaring Brook editor contacted me in 2009, I probably printed 400 copies of Leo Geo. I had given a copy of Leo Geo to a First Second editor as a part of a “thank-you” package for her recent trip to the Center for Cartoon Studies. I think that it just got passed around the Macmillan office and ended up at Roaring Brook. By 2011, when I was finally sitting down to rework the art, Leo Geo was 4 years old, and needed work to make it publication-ready. I redrew 90% of the book, and re-lettered 100%. The focus of the book was really honed in to geology, so portions of the book that dealt with what sort of vitamins you find in eggs, and where rope comes from, didn’t make the cut. A couple of pages had to be added at the beginning and end to house all of the pertinent book information (copyright stuff, title page, etc) that wasn’t in the self-published version. How did you decide what the Earth’s insides were going to look like? For the most part, it’s not like there’s photo reference for that sort of thing. I saw the non-structural components of the underground setting as a journey through textures. As you start at the surface with more sedimentary minerals, the rocks have a craggier texture. As you get towards the core where there’s more liquid rock and metamorphic minerals, I gave the environment a smoother texture. Having this variety was important to help the reader feel like they are GOING somewhere. If the setting stayed too consistent, it’d be boring. I felt like I was balancing on the edge of making the rocks look interesting/accurate, but not have them grab the attention away from Leo. That was the main reason Leo is so simple; he stands out better against the busy background. Leo appears to be weightless in the center of the Earth (which is indeed what would happen if you traveled there, assuming you didn’t get cooked). But you don’t mention it in the text. Why? What did you want to include that didn’t make the cut? I know it might sound too good to be true, but I am actually 100% OK with what was cut from the original version. Leo’s facts were all over the place in the first version. As I started the strip away the non-geology pages, I saw the book get stronger thematically and dramatically. There were, admittedly, some filler pages added in the original version to make his journey out of the core have the same page length as his journey to the core. There was a page about photosynthesis that didn’t make sense. There was a page about eggs (?). There was a couple of really slow pages that dealt with stalactites and stalagmites. I was happy to see those pages go. Also, Leo had a couple of abrasive moments in the original script where he wasn’t necessarily nice to the people around him. That was probably just the work of the snarky 20 year-old Jon Chad that wrote it. When 25 year-old Jon Chad revisited the script with a critical eye, I realized that these snarky moments were out of character for Leo. Some of the violence was also toned down. Tell us about your research process for the science parts of Leo Geo. Did you consult any geologists? I didn’t need to dig too deep (ha ha) to do the research for Leo Geo. A lot of the geological terms I bring up are pretty basic, and could be gathered from library resources. In addition to a copy editor, there was also a geologist that took a look at the script: Dr. Ted Freshney. He was a huge help! A really clutch part of the science side was the decision to include the “A Note on the Geology” section. On the rare occasions that I played a little loosey-goosey with the facts, I wanted to come clean. No, you wouldn’t find fossils any deeper than the Earth’s crust, but the facts about the fossils are rock solid. There probably isn’t anything living in the 2500-degree core of the earth, but you can’t know for sure! How about your drawing process? The process is pretty straight-forward. First I pencil the pages, then ink them with a couple different tools, then draw the word balloons separately and add them in digitally. When I sat down to rework the art from the 2007 version to what it is now, I actually worked right on the originals, whiting out stuff and adding more texture. 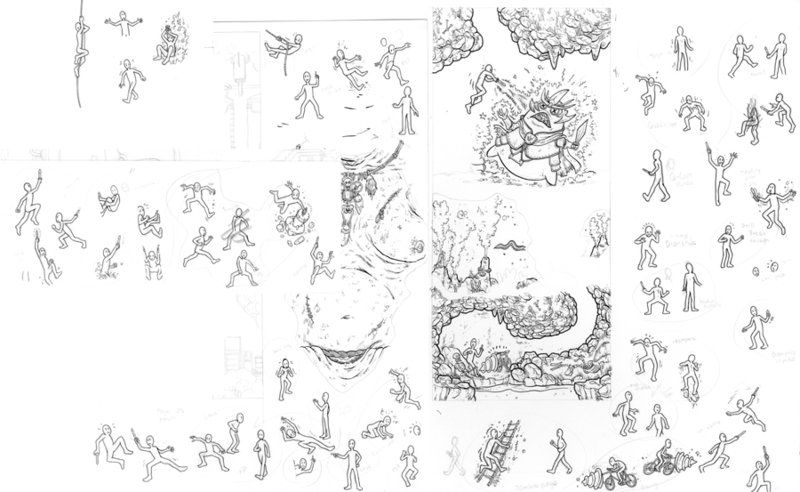 I remember telling someone that I might have actually saved myself some time by creating all new pages, instead of trying to freshen up the old ones, but using the old pages as an underlying structure gave the work a backbone that I wouldn’t have gotten otherwise. When there were correction that were so big that it didn’t make sense to use that much white out, I made these sheets of patches, then drop them in digitally. Here you can see a bunch of the patches I had to add as well as a gaggle of new Leos. It’s weird to see them all bunched on there like that. How do kids respond to this book? Are they into the adventure, or the science, or both? It really varies based on their age. I find that younger kids respond better to the adventurous aspects of the book. They have no idea what ferromagnetism is, and that’s why that specific fact isn’t integral to the story. They’re into the monsters, robots, and all the other gizmos that would have sent my juvenile heart aflutter. Once kids get a little bit older, they quickly grasp the idea of the Earth having layers, and how each of those layers, as overall settings, differ. Finally, around 11 or 12, I have more kids coming up to me and nerding out about the facts like struzstroms. I wanted the book to have an easily digestible narrative that isn’t dependent on the facts, but supported by them. 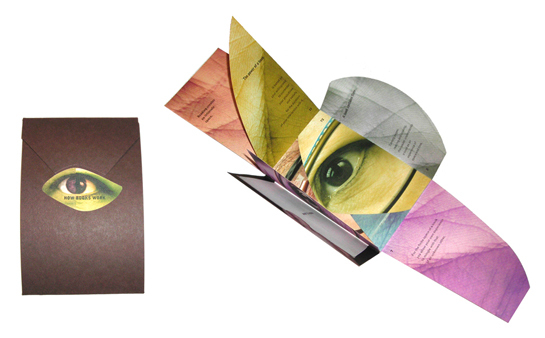 Bookmaking, and exploring the interaction between reader and book, is one of my passions. In that regards, the middle of the book is the most important part to me. After following Leo go straight down into the earth for 16 or so pages, I ask the reader to flip the book upside down and read the book from bottom to top. Now, while this is pretty simple stuff in the wild world of artist books, I’m essentially asking the reader to purposely BREAK the rules of reading. I’m asking them to consciously IGNORE years of public schooling and follow a character UP, against reading flow. When I watch new readers interact with the book, that book turn is the pivotal moment. Have I engaged them enough in the story that they’re willing to break reading rules? Do they understand that this decision isn’t being made haphazardly, but is directly tied to the narrative? To date, I have NEVER seen a kid not understand the book turn, and not get excited by it. It’s easily the most rewarding part of this whole experience. The only people that seem to have a problem with it is adults. I see a lot of adults trying to read the book sideways, tilting their head to a, clearly, uncomfortable angle. My work is heavily rooted in the ideas of the book as a physical object and a time-based medium. I view reading as an intimate act in which the reader must be in close physical proximity to the book, can control the pace of reading through the self-directed turning of pages, or equivalent action, and must interact with the book through the manipulation of the book’s physical structure. Where’s Leo Geo going next? Space! 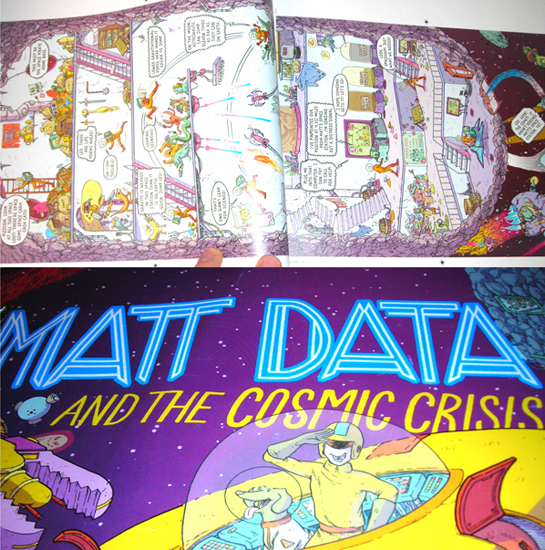 Leo and his brother Matt Data are going to have a stellar adventure in Leo Geo and the Cosmic Crisis. I just got the proofs back and am totally jazzed. It’s not going to be the same format, because the long, skinny format doesn’t make sense for space. When you are boring a hole straight down, you are only dealing with one direction. When you are in space, you not only introduce a second component of horizontal movement, but also in/out z-axis movement. It should be coming out in September! Anything you wish we had asked? Add/answer here! You’ve mentioned artist books a couple times now; how can I see some? Any University Special Collections department worth their weight in salt will have some artist books. My favorite collection is in the University of Vermont. A lot of Special Collection libraries that I’ve visited will let non-students see items in the collection as long as you express interest and can give them an idea of the sort of artists you’re looking for. Here’s a few of my faves: Julie Chen, Barbara Tetanbaum, Clair van Leet, Margaret Kaufman. If you live in the NYC area, the MoMA purchased the Franklin Furnace collection of Democratic Multiples back in 1993, which was the seed for their artist book collection. You can see this collection in the MoMA Library. AND FINALLY: That’s a nifty-looking tattoo I see on your bicep. Care to explain? Ha ha, those are the process colors; the four colors traditionally used to print books. The shorthand is CMYK and it stands for Cyan, Magenta, Yellow, and Key (black). If there’s any gang that I would claim membership to, it would be the gang of book-lovers. I know I’m bludgeoning the metaphorically expired equine, but this is just one way that I can show that I’m totally obsessed with the book-making process, and a huge print nerd. …AND NOT FINALLY! Jon had so many smart and interesting things to say about bookmaking that I’m going to save his thoughts on book formats for another post next week. Stay tuned! In the meantime, visit him at his website or at the Fizzmont Institute of Rad Science. Many thanks, Jon! 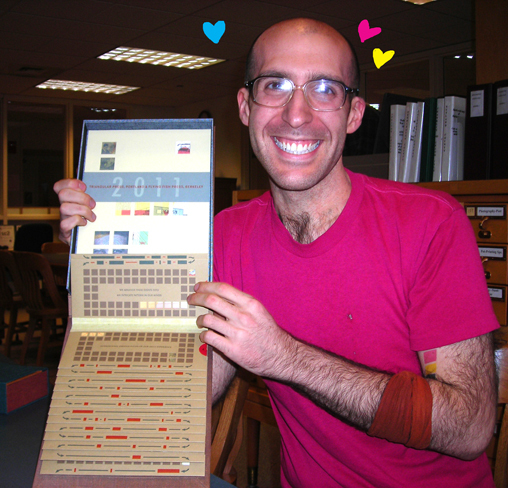 Saw Jon Chad’s book at the library today. First the awesome shape then the bold color and cartoon image caught my eye. Being an artist and writer myself, I had to pick it up. It made me think my own book should incorporate a similar shape because I’m writing about two sisters creek walking come across a Bigfoot. 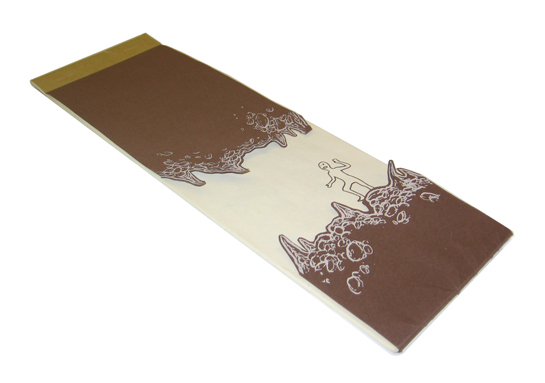 Because of the size difference began Bigfoot and the girls, the book shape ( skinny and vertical) would be great. I absolutely loved your interview of Jon, the layout of the questions and his answers were so entertaining. Thanks. A number of boys in my school really love Leo Geo. They think the skinny, vertical format is fun, and they love the detailed drawings. The book gets checked out a lot.